51 Beautiful Kurti With Skirt Sets To Sparkle In This Festive Season! Ladies, it’s time to break the rules! Give your wardrobe a fun twist with this beautiful pink kurta paired up with a pink skirt. How to style it? You can team it up with a gold churidar. Price: Rs 1,499. Buy it here. Don’t settle for boring basics. Check out this red brocade sleeveless kurta! It comes with a half button placket paired with a royal blue flared skirt. We especially love that it has an elasticated waistband and contrast hem. This long kurti with skirt can be your pick for a cards' party at a friend's place. Price: Rs 1,799. Buy it here. With this white and blue sleeveless printed straight kurta, you now have a befitting reply to whoever said simple is boring. The boat neck with contrast piping and key-hole with button closure at the back is sure to stand out. This blue and white piece teamed up with a white long skirt is just what you need to wear during this festive season. Price: Rs 999. Buy it here. Look graceful sporting this lovely red zari embellished short kurta with a flared white long skirt. The yoke of the kurta is beautifully highlighted with golden zari embroidery and buttons on the placket. Price: Rs 1,599. Buy it here. Embellishments are the IT thing during the festive season. Check out this yellow embellished short kurti with a textured maxi skirt that has beads along the hemline. Spice up your look with a pair of golden earrings. Price: Rs 1750 Buy it here. Black, red and gold are the three colours we swear by when it comes to dressing up during Diwali. 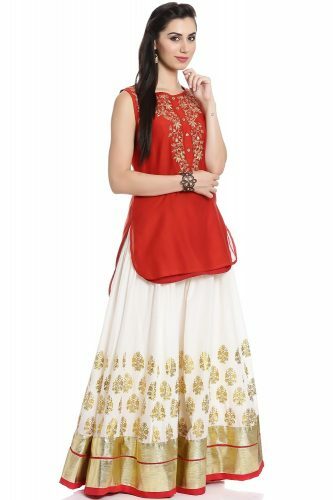 This black Anarkali kurta and red skirt will make you look super elegant. The best part? Both the kurta and the long skirt have khadi work on it. Price: Rs 895 Buy it here. 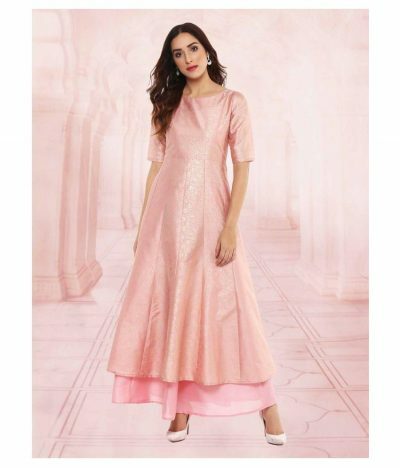 This baby pink kurta is an elegant ankle-length anarkali kurta. You can even treat it as a gown - if you prefer the style. The pink silk-like material looks rich with a metallic gold print all over, giving it a brocade look. This is the statement festive style this season! Price: Rs 999. Buy it here. While all colours definitely make your festive ensemble more lively, nothing beats an all-black attire. This kurta is adorned by a gold embroidered pattern on the front and the sleeves. You can team it up with your black skirt to complete the look. Price: Rs 648 Buy it here. Looking for some ethnic wear but don’t want to look too traditional? This Indo-western gown style kurta is a good bet for party wear. The net below the yoke has a side slit running right from below the yoke, till the bottom. This small touch will make your outfit look fabulous! Price: Rs 699. Buy it here. Red is the colour of love and one of the most loved colours during the festive season. Add more glamour and shimmer to your occasions by showing up in this red Anarkali. The creation includes block print kurta with full sleeves and band collar with a golden sparkly long skirt. Price: Rs 895. Buy it here. Embrace some blue hues with a solidly printed contrast kurta featuring front tussles and high low pattern. 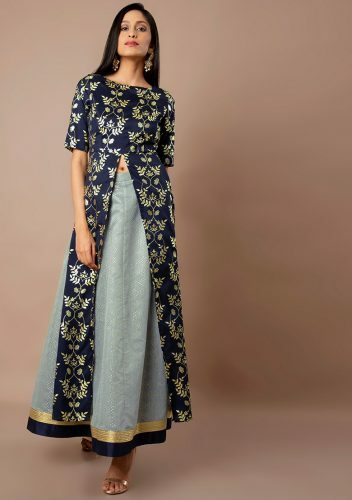 The white and blue long skirt is the perfect contrast for this dark blue kurta. This long kurta with a front slit is great for an easygoing festive look. Price: Rs 751. Buy it here. A blue and green combination is one of the most soothing ones. Cast a spell with this straight flared festive and party wears ladies kurti. Indigo blue with parrot green long skirt with side Dori is one of the best colour contrasts if you want to ditch the usual hues this season. Price: Rs 1,056. Buy it here. 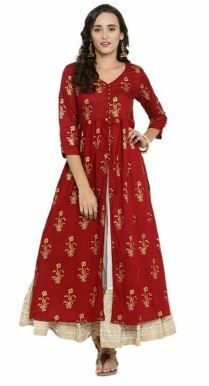 Transform yourself into a vision of loveliness by wearing this elegant long red kurta. Let this classic round neck kurta paired up with black long skirt enhance your attire. Price: Rs 1649. Buy it here. 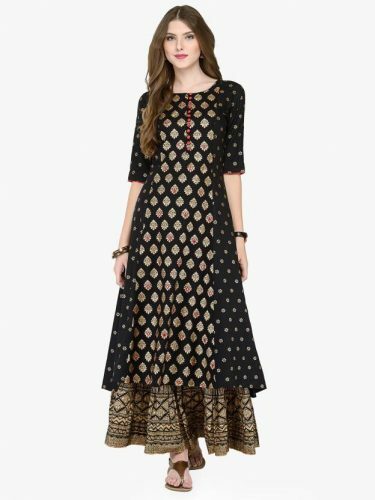 Give yourself an ethnic look with this pretty black kurta with a black and gold long skirt. Featuring an elegant band neck, short sleeves, and embroidered pattern, this high-quality set highlights your beauty. Price: Rs 2,999 Buy it here. Lend your basic look an addition by choosing this red and black ethnic set. The khadi work on both the long kurta and the long skirt adds a feminine finishing touch to the outfit. Price: Rs 2,612. Buy it here. Deck up for any function wearing the elegantly crafted black kurta with a red long skirt to look traditional. The classy round neck and three-quarter sleeves will enhance your facial profile. Style this set with a pair of heels for a flattering silhouette. Price: Rs 2,099 Buy it here. Update your ethnic assortment with oodles of feminine charm by picking this peacock colour velvet kurta. Flaunt your traditional side wearing this beautiful kurta with a skirt. This Kurti will surely fetch you a lot of compliments for your rich sense of style. It will be a wonderful addition to your wardrobe. Price: Rs 3599. Buy it here. Look stylish while feeling comfortable by wearing this finely crafted indigo blue peplum kurta and off-white long skirt. It is crafted from high-quality cotton fabric that ensures you stay comfortable all through the day. Complete your ensemble by wearing this set with a pair of chandbaalis and a simple necklace. Price: Rs 1,349. Buy it here. Superbly crafted in vibrant hues, this bright pink kurta brightens up your personality even more. 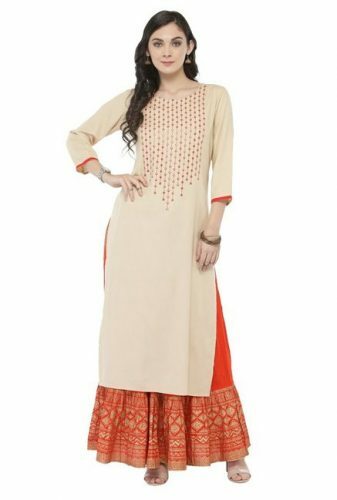 Made from quality cotton fabric and featuring a lovely tangerine long skirt, this round neck kurta is ideal for regular wear. Price: Rs 1,749 Buy it here. Provide your ethnic silhouette with a touch of vibrant sophistication with this elegant pink kurta with a dark blue jacket. This A-line kurta with long jacket has a tassel detail. It can be worn both with and without the jacket. It is crafted from cotton fabric to keep you comfortable always. Price: Rs 998. Buy it here. Get a perfect blend of glamour and trend with this royal blue Bangalore silk kurta with a net coral skirt. Thanks to the golden work on this kurta, it possesses a fashionable allure. Team this kurta with a pair of gold earrings and sandals to complete your look. Price: Rs 1,799 Buy it here. 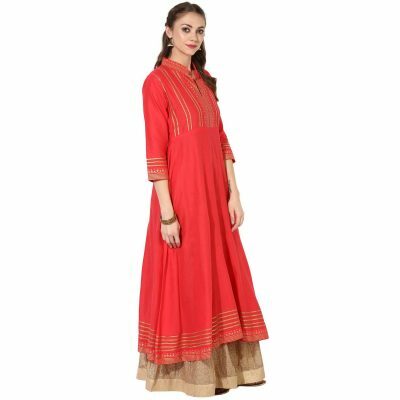 Arrive in a standout style with this coral Banarasi silk kurta. Featuring a round neck and three-quarter sleeves, this kurta is blessed with a trendy enticement. The beige-gold long skirt adds to the festive flavour. Price: Rs 3,780. Buy it here. Deck up for any function wearing the elegantly crafted and ever so classy bottle green kurta and long skirt. The classy round neck and three-quarter sleeves of this printed set enhance your personality. Style this set with a pair of heels for a flattering silhouette. Price: Rs 2,149 Buy it here. Look stylish while feeling comfortable by wearing this finely crafted ivory straight gold printed kurta. It is crafted from high-quality cotton fabric. The classy mandarin collar, three-quarter sleeves and khadi work will make you look elegant and royal this Diwali. Price: Rs 2,565. Buy it here. Stylishly designed to add oodles of charm to your party style is this red kurta with an off-white long skirt. Offering unmatched comfort and courtesy soft rayon fabric, this long kurta is perfect to wear with heels. Price: Rs 2,299 Buy it here. Display your true elegant side in this charming orange with gold print A-line kurta. Featuring a mandarin collar, three-quarter sleeves and khadi work, this kurta boasts of enticing urbanity. Price: Rs 1,919 Buy it here. Get ready for the festive season by sporting this grey tunic which is a perfect blend of modern and traditional and is ideal party wear. Features triangle foil print, cold shoulders and high-low hem to suit the modern wearers. Add to your classic, charming look by pairing this set with sandals and some simple Indian jewellery. Price: Rs 2,800. Buy it here. Redefine your ethnic style with this blue gold printed A-line kurta. Features gold embellishment, round neck and three-fourth sleeves. Price: Rs 2,993. Buy it here. This navy tunic is your new occasion wear savior. Featuring foil print and extreme-high center slit, it will make you look regal this Diwali season. Style it with cigarette pants and strappy wedges for a killer look. Price: Rs 2,450 Buy it here. Get effortless, on point party look with this all-black kurta and long skirt set. With minimal embellishment on the kurta and a long skirt with khadi work, this set is the perfect way to welcome the festive season. Price: Rs 1881. Buy it here. Sport a stylish ethnic look with this attractive chanderi kora silk kurta and dual bottom. Crafted to perfection, this clothing set is a perfect pick for social gatherings or festive events. Style this clothing set with matching earrings and peep-toe pumps to sport an elegant look effortlessly. Price: Rs 3,695 Buy it here. 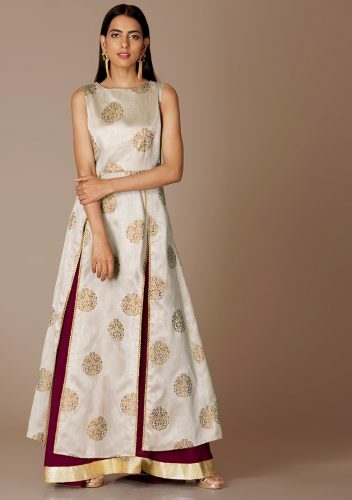 This ivory kurta with beige and gold is a necessity in every closet. Enlivening your ethnic look by embracing light colours this Diwali. Price: Rs 1,785. Buy it here. Refresh your ethnic ensemble with this short jacket kurta paired up with a red long skirt. It has a mandarin collar and three-fourth sleeves in Banarsi Silk that can make you look a class apart. Price: Rs 1,122. Buy it here. Refresh your ethnic ensemble with oodles of feminine style by picking out this flex viscose kurta set that features a faux layered look, hand-block printed at the contrast lower panel, and complemented with a center boota. Price: Rs 1,484. Buy it here. Freshen up your ethnic closet with this blue and white kurta skirt set. The kurta is light in weight and comfortable to wear all day long. This attire will lend you a glamorous look, that is just perfect for Diwali. Price: Rs 1,122. Buy it here. This Diwali, show off your elegant style with this yellow Kurta paired up with a pink long skirt. Sport this piece with studded flats or stilettos and minimal jewelry for a simple yet stunning evening ensemble. Price: Rs 2,051. Buy it here. This trendy peach kurta will take your personal style to new heights. Paired up with an off-white long skirt, it is a stylish option for a relaxed family function or event. Price: Rs 2,009. Buy it here. 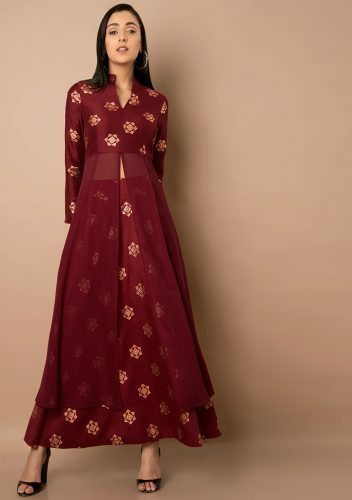 Merge tradition and modern fashion in this velvet maroon kurta and cream-colored skirt and feel feminine and modest for any occasion. Versatile for the city or on vacation, style this kurta set with this season's most coveted heels or flats for a trendy look. Price: Rs 2,969. Buy it here. Look like an Indian diva as you sport this maroon kurta with a center slit paired with a cream-colored netted skirt. You can also create different looks for different occasions using this skirt. Price: Rs 1,788. Buy it here. This sea green ethnic has been designed as per the latest Indian Wear trends. With microscopic dots running all over, this set is going to fetch you a lot of compliments. Price: Rs 3,299. Buy it here. 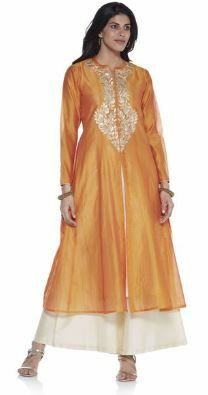 Give yourself a trendy makeover by wearing this orange kurta with an off-white long skirt. It flaunts a solid design around the collar and gives it a classy appeal. Moreover, it has been made of fine quality fabric, which ensures day long comfort and easy maintenance. Price: Rs 2,999. Buy it here. 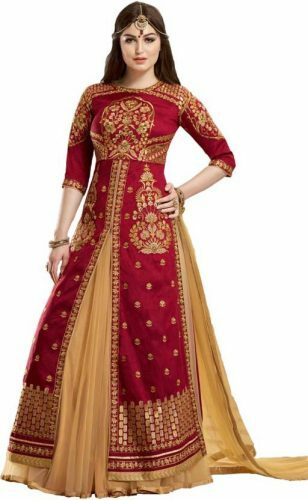 Embrace ethnicity with this beautifully designed Anarkali kurta with a center slit. It features a V-neck, block prints and three-quarter sleeves which gives it a trendy look. 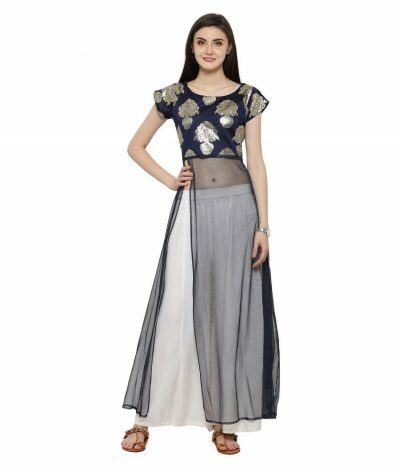 The off-white long skirt goes perfectly with this stylish kurta. Price: Rs 2,079. Buy it here. 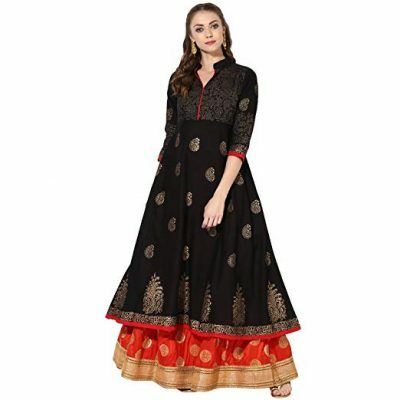 Showcase elegance mixed with class by wearing this amazing black long kurta. Your skin will love the feel of this perfect fit kurta as it enhances your features. The khadi work on this kurta makes it look stunning. Price: Rs 1,879 Buy it here. Get in touch with your ethnic side by wearing this chic cream-colored kurta with an orange long skirt. This kurta features an elegant round neck, three-quarter sleeves and embellished pattern that gives it a stylish look. Price: Rs 1,754. Buy it here. 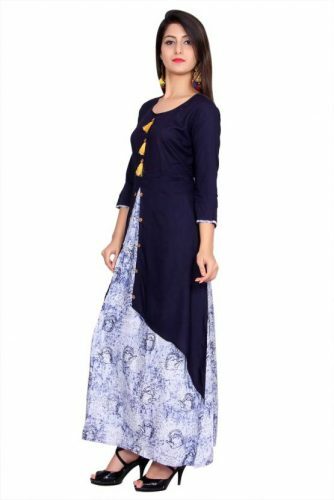 Sometimes, a stylish kurta can elevate your look, so opting for this trendy A-line rayon printed floor length slit kurta will be a great idea. Crafted from fine quality fabric, it is paired with a plain black skirt that lends it a classy appeal. Price: Rs 2,399. Buy it here. 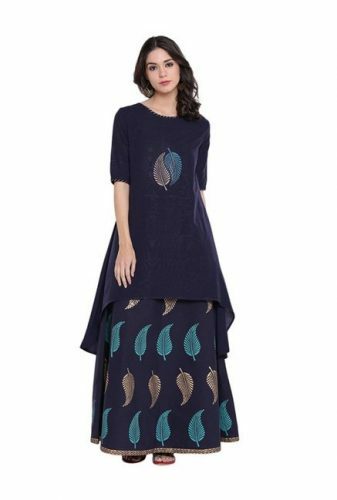 Embrace your traditional roots by wearing this gorgeous contemporary navy cotton kurta with a skirt set. This kurta features an elegant leaf handprint. To complete the ensemble, it is paired up with a tonal matching hand block printed skirt. Price: Rs 2,520. Buy it here. Revamp your wardrobe with this cold shoulder maroon kurta paired with a beige long skirt. This is an apt addition to your ethnic wardrobe and makes perfect evening wear for a number of occasions. Price: Rs 2,800. Buy it here. Make a statement in this simple but chic, grey party wear tunic. Crafted using brocade, this tunic features a high-slit in the center and half sleeves. It is paired with a classic beige long skirt that will add to your feminine charm and grace. Price: Rs 2,450. Buy it here. 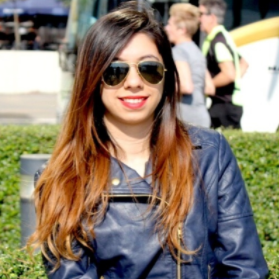 A smart, updated ethnic style jacket that goes with both skirts and pants. This kurta features sequin embroidery and a matching crop top. This set gives you both an authentic ethnic look and a modern look. Can it get any better? Price: Rs 1,658. Buy it here. Rev up your ethnic look by wearing this maroon tunic that features foil print, high slit and cut out back. This kurta features a V-neck and an intricate design. Pair it up statement earrings to complete the full ensemble. Price: Rs 2,400. Buy it here. Get ready to party this festive season by wearing this beige tunic that is equal parts chic and trendy. It is paired up with a deep purple long skirt that has a golden border. It features foil print all over and double slit on the front. Price: Rs 2,700. Buy it here. 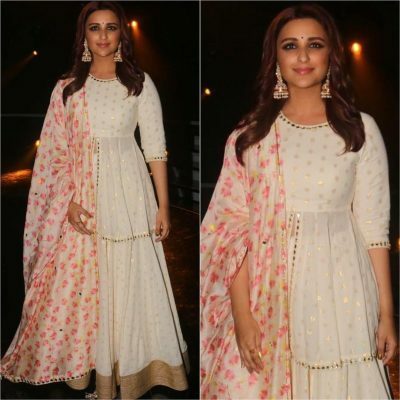 Parineeti Chopra wore white mirror work separates from Abhinav Mishra that included a long blouse and a matching skirt. Floral print dupatta, simple hair, a tiny bindi and dangling earrings added finishing touches to her look. Anushka Sharma was seen clad in a teal green embroidered sharara from Matasya that she paired with contrast pink bandhani dupatta at a promotional event for Sui Dhaaga. A pair of dangling earrings, a pair of juttis and a pink lipstick completed her look. 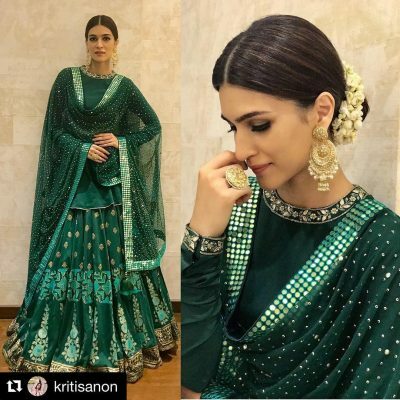 Kriti Sanon sported a bottle green lehenga by designer duo Sukriti & Aakriti for the occasion. 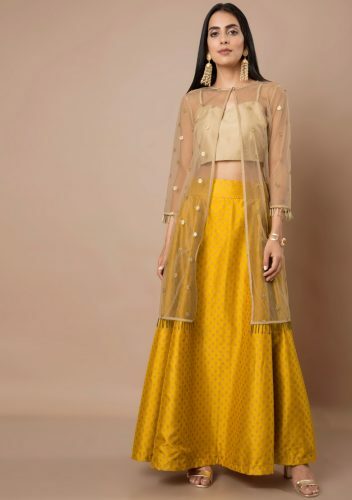 The lehenga skirt featured golden gota detailing and patchwork that lent a festive touch to her ensemble, while the mirror detailing on the dupatta added the necessary embellishment to the otherwise simple kurta top. 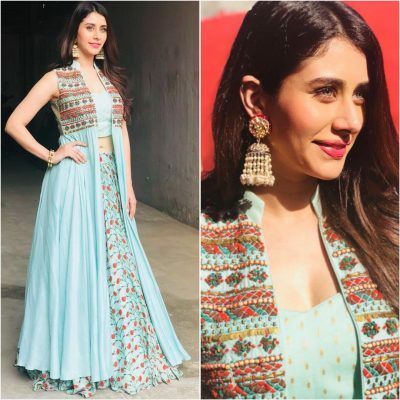 For the promotions of Love Yatri, Warina Hussain wore a blue printed long skirt paired with matching crop top and embroidered long jacket by Label Anushree. Taapsee chose designer Ridhi Mehra for the occasion, styling a black and white top featuring her trademark feather tassels with a flowy lehenga-style skirt. Malaika attended Arpita Khan and Shilpa Shetty’s Ganesh Chaturthi celebrations wearing a green sharara suit by Simar Dugal. AWESOME NEWS! POPxo SHOP is now Open! Get 25% off on all the super fun mugs, phone covers, cushions, laptop sleeves, and more! Use coupon code POPXOFIRST. Online shopping for women never looked better This story was updated in January 2019.